It started on April 18, 1886. A few minutes before 1 o’clock the fire started in a Chinese cook house on the corner of Hotel street and Smith’s lane. It started accidentally by the owner of the premises in lighting his fire for cooking. After a seven-hour ordeal-about half of it in darkness-the walls of the last building to collapse fell in. It was exactly 11:20 and the place was the makai side of the King Street bridge leading across to the Palama district. As the embers cooled, tempers flared. Hawaiians of Chinatown, especially around the ʻEwa side of Maunakea Street, where they had been the greatest losers, were bitter. They blamed it all on the Chinese. By midnight a mob of perhaps 3,000 crowded around the King Street bridge and back to the Chinese theater. As Hawaiians itched for a fight, things could get nasty – fortunately, cooler heads prevailed and while skirmishes occurred, a full-on riot was avoided. Honolulu’s Chinatown, then and now, is the approximate 36-acres on the ʻEwa side of Downtown Honolulu. It developed into a Chinese dominated place, following the in-migration of Chinese to work on the sugar plantation, starting in 1852. Between 1852 and 1876, 3,908 Chinese were imported as contract laborers, compared with only 148 Japanese and 223 South Sea Islanders. Around 1882, the Chinese in Hawaii formed nearly 49% of the total plantation working force, and for a time outnumbered Caucasians in the islands. By 1884, the Chinese population in Honolulu reached 5,000, and the number of Chinese doing plantation work declined. As a group they became very important in business in Hawaii, and 75% of them were concentrated in Chinatown where they built their clubhouses, herb shops, restaurants, temples and retail stores. By 1886, there were 20,000 people living in the area between Nuʻuanu Stream, Nuʻuanu Avenue, Beretania Street and Honolulu Harbor. Most of the structures were one- and two-story wooden shacks crammed with people, animal and pests. Chinatown had a poor water supply system and no sewage disposal. Although the fire intensified anti-Chinese feeling, this group had long been under attack. During the 1880s, spurred by what was considered an alarming influx, the Hawaiian government had limited – and for a time halted – their coming. The year before the fire, massive Japanese immigration started. It had been conceived and encouraged not only to man plantation fields, but also to provide a counterbalance to the Chinese. The 1886 blaze destroyed eight blocks of Chinatown. While the government soon after established ordinances to widen the narrow streets and limit building construction to stone or brick, nothing was enforced. More ramshackle buildings went up, laying the groundwork for future disaster and disease. The 1886 fire started at the corner of Hotel and Smith Streets. In 1900, fire struck again. However, in 1900, the Board of Health intentionally set “sanitary” fires to prevent further spread of the bubonic plague. Those got out of control. The 1900 fire caused the destruction of all premises bounded by Kukui Street, River Street, Queen Street (presently Ala Moana Boulevard) and Nuʻuanu Avenue. Today, the majority of buildings in Chinatown date from 1901 with very few exceptions which escaped the January 20, 1900 fire. 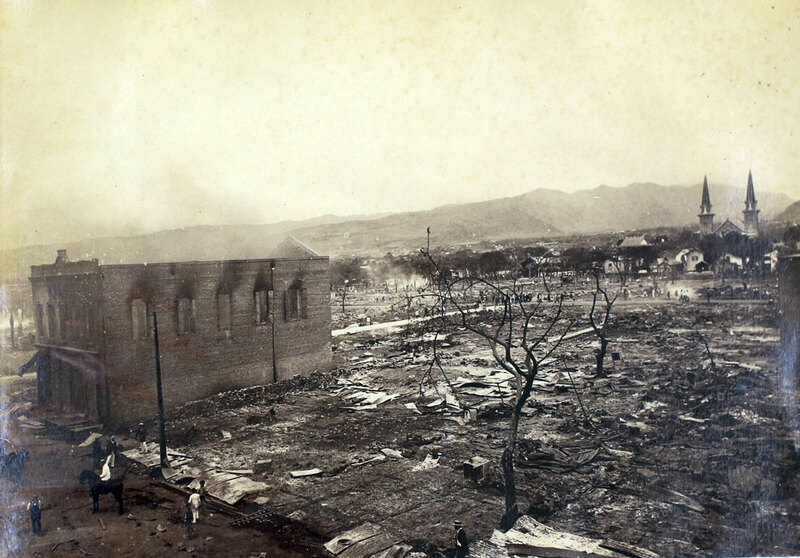 The image shows the aftermath of the 1866 Chinatown fire. In addition, I have added other images in a folder of like name in the Photos section on my Facebook and Google+ pages.